14.5 Amp Electric Chainsaw. Electric Chainsaw (model UC4051A) is engineered for fast cutting, efficient operation and easy maintenance, without the hassle of gas. 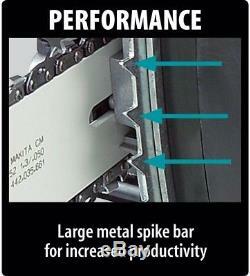 It has a chain speed of 2900 FPM for forceful cutting and trimming. A built-in current limiter is engineered to protect the motor from burnout by reducing power when the saw is overloaded and an electric chain brake offers maximum productivity. Additional features include an automatic chain oiler for heavy continuous cutting and a large oil reservoir with view window that allows the operator to easily check the oil level. For increased comfort, the chain saw has ergonomic rubberized grip handles and a large trigger switch with soft start for smooth start-ups. California residents: see Proposition 65 information. 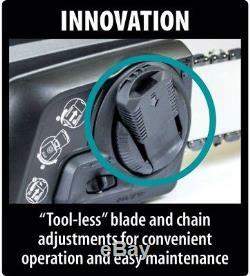 Tool-less blade and chain adjustments for convenient operation and easy maintenance. 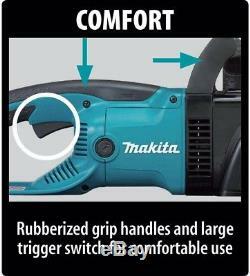 Rubberized grip handles are ergonomically designed for comfort. Large trigger switch with soft start for smooth start-ups. Built-in current limiter helps protect motor from burnout by reducing power to motor when saw is overloaded. Automatic chain oiler keeps 16 in. Bar and chain adequately lubricated. 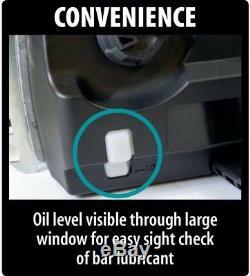 Large oil reservoir with view window allows operator to check bar oil level. Electric chain brake for maximum productivity. Equipped with ergonomic rubberized grip handles and a large trigger switch. Front hand guard protects operator from flying debris. Lock-off button prevents accidental machine activation. Cord hook prevents unintended power disconnection. : 16 Chain Size: 16 in. : 16 Maximum extension cord length ft. : 50 Amperage (amps): 14.5 Chain Pitch: 3/8' Chain Speed (mps): 14.5 Chainsaw Size: Medium Chainsaw Type: Hand Chainsaw Drive Links: 56 Features: Antivibration Handle, Chain Brake, Tool-Less Chain Tensioning Gauge. 050 Handle Type: Rear Handle Chainsaw Included: Chain Power Type: Corded Electric Product Weight lb. Our stock all ships from our US based warehouses. These products are manufactured according to the specifications of the US Electrical Standards and codes. We assume no responsibility if the item malfunctions or causes an accident because you tried to use the product with foreign electrical standards. The Use with a converter or other voltage transforming device is at your own Risk. When returning an item, it must be in all of the original packaging and include all of the original accessories or items that came with it. The item and package should be in original and perfect condition. We do our best to process as quickly as possible. We guarantee that your issue will be solved quickly. We usually respond within 24 hours on weekdays. 14.5 Amp Electric Hand Chainsaw Antivibration Handle Outdoor Power Tool" is in sale since Monday, October 02, 2017. This item is in the category "Home & Garden\Yard, Garden & Outdoor Living\Outdoor Power Equipment\Chainsaws". The seller is "familyfirstsales" and is located in Charleston, West Virginia. This item can be shipped to United States, Canada, United Kingdom, Denmark, Romania, Slovakia, Bulgaria, Czech republic, Finland, Hungary, Latvia, Lithuania, Malta, Estonia, Australia, Greece, Portugal, Cyprus, Slovenia, Japan, China, Sweden, South Korea, Indonesia, Taiwan, South africa, Belgium, France, Hong Kong, Ireland, Netherlands, Poland, Spain, Italy, Germany, Austria, Israel, Mexico, New Zealand, Philippines, Singapore, Switzerland, Norway, Saudi arabia, Ukraine, United arab emirates, Qatar, Kuwait, Bahrain, Croatia, Malaysia, Brazil, Chile, Colombia, Costa rica, Panama, Trinidad and tobago, Guatemala, Honduras, Jamaica.